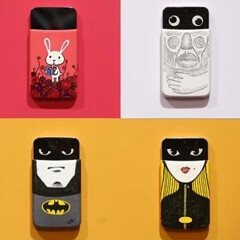 Last month, LG released an unusual smartphone in South Korea: the AKA, a handset that comes with specially crafted cases that give it personality and can transform it into different characters (they even have eyes!). To showcase what can be done with such a crazy device, LG recently made the AKA the star of an art exhibition. Various Korean artists have created paintings, and even sculptures, using the AKA and its cases - and we must say that everything looks pretty cool (images from the exposition are available in the slideshow below). The LG AKA has an unusual aspect only when one of its special cases is on. The device itself isn’t that special, though it’s still a nice Android KitKat handset. Its features include a 5-inch 720p IPS display, LTE and NFC, quad-core 1.2 GHz processor, 8 MP rear camera with laser autofocus, and 1.5 GB of RAM. While customers in South Korea can already buy the LG AKA, it’s unlikely that we’ll see the phone being released anywhere else. It's amazing what will pass for innovation these days. Who doesn't want a Batman phone? Seems they're set on trying to sell it as initiative and artsy. So it can display, what..four different eyes? Really not sure who they're trying to appeal to.